Sometimes, there just aren’t enough words to describe the irony. 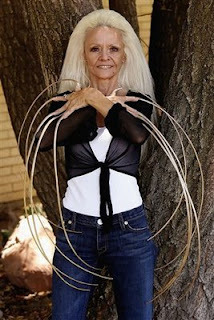 This lady had the world record for longest nails, which she hadn’t cut in 30 years… and in a twist of fate, she was thrown from a car in an accident, and survived near death. But her nails didn’t. I can’t tell you how utterly grossed out I am by this photo. I keep thinking of all of my daily, mundane tasks, and how I would manage to do them if I had lassos for fingernails. Not to mention how difficult it must be for her to find mittens that fit.